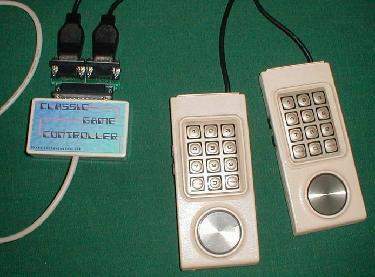 Classic Game Controller | Welcome to the Intellivision Revolution! The Classic Game Controller allows you to play Intellivsion games on the PC with the original controllers. It is one the only PC interface that allows 16 directions on the disk! 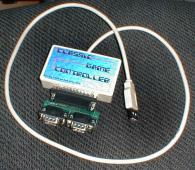 The CGC is an interface between two Intellivision controllers and the PC. The PC side is a full speed USB 1.1 connector. 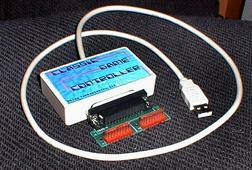 There are two available adapters for it; one with 9-pin headers for the original Intellivision style controllers and one with DB-9's for the Intellivision II / Sears Video Arcade style controllers. In order to use the CGC you need an x86 based PC with Windows 98, 2000, or XP and an available USB 1.1 port. We recommend a processor speed of at least 300MHz. The CGC only works with the Nostalgia and JZIntv Intellivision emulators. Download the CGC drivers for Windows by CLICKING HERE. If you are a software developer and would like to create drivers for the CGC, download the SDK by CLICKING HERE.